This book gives a description of the theory of the heart cycle phase analysis based on a new fundamental scientific discovery explaining the phenomena of blood flow in large blood vessels. Previously, the concept explained the blood flow as a flow under laminar flow conditions. That was the basis for the former theories of functioning of the heart and the blood vessels. That approach was not capable of explaining many matters of the fact and conflicted with the reality. The use of improper concepts and improper conclusions made it impossible to apply any metrological basis to widely used diagnostics methods. First of all, it referred to the ECG-based diagnostics. As a consequence, all existing methods of non-invasive diagnostics of the heart and blood vessels could be considered to be rather indicating but not measuring systems. The theory of the superfluidity of blood developed by us makes it possible to create absolutely new diagnostics criteria supported successfully with metrology, based on the relevant ECG and rheogram. The method of the phase analysis described in this book shall be treated as the first step towards the theory of the differential diagnosis of the functioning of the heart and the blood vessels. This alone would show the possibilities of a more precise determination of the cause of pathology as early as possible. Up to present time, all methods have been based only on integral indices that allowed to diagnosticate deceases postfactum. The theory presented in this book makes it possible to forecast eventual development of pathological processes, if any, that was not the case before. We would like to express our hope that our researches might contribute to further development of the theory of cardiology, and practicing physicians would be given a new possibility to control diseases of the cardiovascular system in a great variety of their manifestations. Introduction. 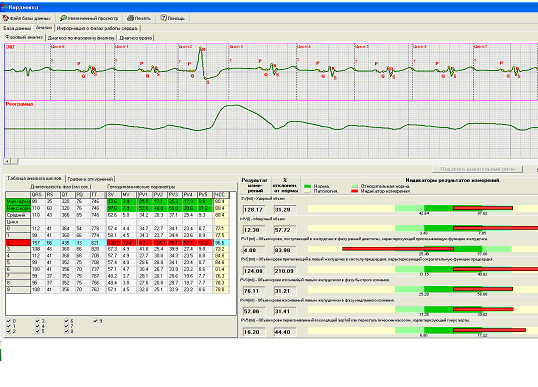 The cardiology specialists have long been interested in measuring hemodynamic parameters. Of prime importance in this case is to determine the volumes of blood delivered by the heart in its every cycle phase. Knowing the volumes of blood pumped by the heart sections in every cardiac cycle phase, one can diagnosticate precisely the finest changes which may occur in the heart and the cardiovascular system both under their normal and abnormal pathological conditions. Until the present time, the volumes of blood have been measured by catheterization of large arteries only. In more recent times, another possibility was offered to measure stroke volumes of blood with ultrasonic scanners. But the possibility of taking measurements of the volumes of blood entering or exiting any individual section of the heart has remained for a long time a dream, and a serious hindrance thereto was an imperfect theory of hemodynamics. This Article deals with the most significant results obtained by our international research & development team with use of an absolutely new medical instrument developed by us, and these results make it possible to take a fresh look both at the theory and the practice in hemodynamics offering at the same time absolutely new diagnostics capabilities in cardiology. Since the beginning of the 80-s the Authors have been deeply studying the phase analysis of the cardiac cycle . For this purpose used are results obtained earlier in some other interesting investigations  which were very close to the development of an adequate model in hemodynamics. But unfortunately, those theories failed to receive their support in the practice. It becomes clear that it is required to identify precisely those biophysical processes which are responsible for the blood circulation and implement an innovative concept of measuring basic blood circulation parameters. The excellent solutions of the above problems are proposed by us applying the phase analysis of the cardiac cycle when analyzing every cardiac cycle phase identified on an ECG and a RHEO recorded from the ascending aorta . Research objective. Development of an absolutely new non-invasive method for measuring basic volumetric values in hemodynamics on the basis of the cardiac cycle phase analysis. Method. Investigations of hemodynamic processes in the blood circulation are conducted on a fundamentally new scientific basis, i.e., on the concept according to which the blood flows through the blood vessels under the so-called “third” flow conditions. 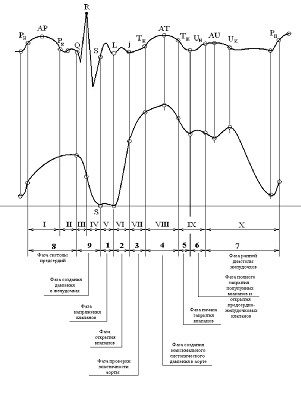 The first theoretical and experimental researches in the field of flow dynamics which resulted in the creation of the theory of the “third” conditions of liquid flow have been carried out by G. M. Poyedintsev more than 30 years ago . 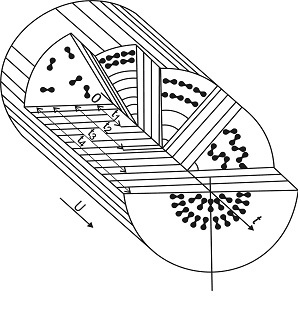 It was found that within the thinnest boundary lamina in liquid, at the initiation of the flow of liquid from its quiescent state, a packet of concentric friction waves is generated propagating from the pipe wall towards its center. This process is shown schematically in Figure 1. Upon reaching the axis of the flow, the waves disappear. If this occurs in a long pipe, at subcritical Reynolds numbers, this process lasts for fractions of a second only, till all friction waves disappear, with the exception of the scattered wall wave. As the result, the unsteady flow of liquid is re-formed and becomes the steady-state Hagen-Poiseuille flow (referred to as the laminar flow). 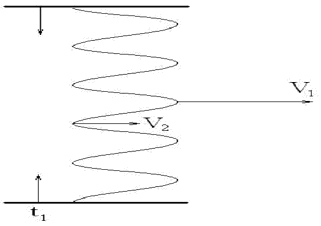 Accordingly, at the initiation of the liquid flow in the pipe, within a very short period of time, there is a changing wave-shaped velocity profile available, and, in accordance with Bernoulli law, a wave-shaped profile of the static pressure occurs, too. Should suspended particles enter this flow, then the transverse gradients of the static pressure push them out into laminae with the lowest pressures which, according to Bernoulli law, are the laminae having the highest velocity. In other words, the structuring of the stream of the flowing liquid occurs in such a way. It should be noted that there is another unique feature of interest – within this period of time the liquid flow is being established with an incomparably less pressure losses due to friction than it may be the case under the steady-state laminar flow conditions. W?– maximum value of velocity in a pulse (at t = t?). These flow conditions are called “the third” conditions to distinguish them from other well-known conditions referred to as the turbulent and the laminar (Hagen-Poiseuille) flow conditions, respectively. It is under “the third” conditions but not under the laminar (Hagen-Poiseuille) ones that blood circulates via the blood vessels throughout our body [1,3]. The distinguishing features of the third flow conditions are that the pressure losses due to friction are significantly less with respect to other cases, and there is a wave-shaped profile of the velocity and static pressure available under the influence of which the flow of blood is laminated forming alternate concentric velocity laminae as follows: alternate high-velocity lamina filled with blood corpuscles and low-velocity lamina filled with plasma (Fig. 2). Based on the theory of “the third” flow conditions, a mathematical method has been successfully developed by us to determine the values of the basic hemodynamic parameters. They are produced by the phase operation of the heart, or in more exact terms, by the phase structure of the cardiac cycle. In order to identify the phase structure of every cardiac cycle obtaining all required relevant data, synchronous recording both of ECG and RHEO signals from the ascending aorta is proposed to use. Both curves recorded in such a way are given in Figure 3 below. The proper location of the areas used for recording ECG and RHEO is of critical importance. The method of arrangement of the electrodes offered by us is similar to that used for the well-known EASI method. According to our method used are 2 (two) electrodes E and S only. 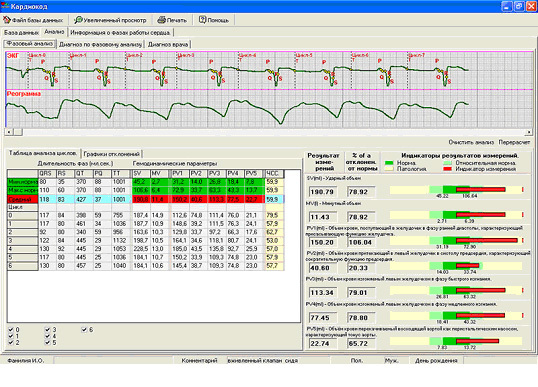 Its distinctive property is that at the same time when an ECG is recorded, the relevant RHEO signals are recorded, too. This method is termed by us a “Point Rheography Method”. Actual records produced with this method are given in Figure 4. In order to establish the required criteria to identify the boundaries of the beginning and the end of the phases in a cardiac cycle on the ECG & RHEO curves recorded from the body surface, the respective derivatives of the above curves are used . This approach makes it possible to computerize the process of the identification and evaluation of the structure in every phase of the cardiac cycle. PV5 – volume of blood (a share of SV) pumped by ascending aorta as peristaltic pump characterizing the current tonus of aorta, ml. - Availability /non-availability of pre-stroke (pre-insult) conditions. Let us consider the most extreme cases studied with our medical instrument developed and implemented by us. These cases cover examinations of patients with artificial aortic valve who run a higher risk of sudden cardiac death. The results of the evaluation of the hemodynamic parameters obtained in these cases are given in Figure 5. The data indicated therein refer to the condition when changing the horizontal position to the vertical one in orthostatic testing. The right bottom part in this Figure shows a deviation of the basic hemodynamic parameters from their normal values in percentage terms. Considering the case in question, they exceed the norms. The greatest deviation of 106, 04% is indicated for PV1 – the volume of blood entering the ventricle in early diastole phase characterizing the suction function of the ventricle. The least deviation demonstrates PV2 – the volume of blood entering the left ventricle in atrial systole phase characterizing the contraction function of the atrium. Upon expiration of several minutes, when transition processes in orthostatic processes gave the way to those of steady-state nature, the hemodynamic parameters tender to reach their normal values. Sudden cardiac death can be identified by an abnormal QRS complex as shown in Figure 6. Figure 5. Phase hemodynamics of a patient with artifical aortic valve. The amplitude of the said complex is approximately three times as high as its normal value. Therefore, the amplitude of the contraction of the interventricular septum exceeds its normal value approximately by the same value. But in this case a stroke volume of blood ejected by the aorta is increased, too. 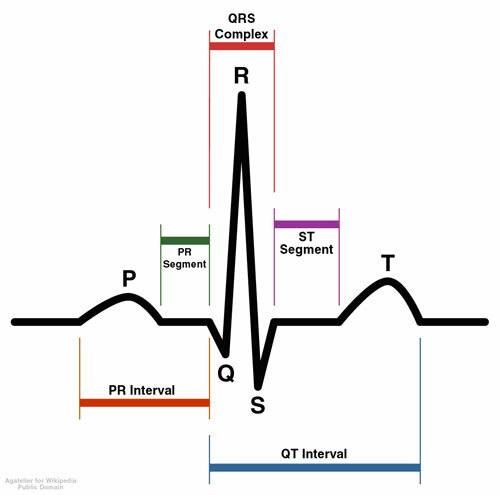 We notice that the stroke volume in cycle two where the abnormal QRS complex is formed is as follows: PV = 128 ml, while an average value is 62 ml only. The case is that the interventricular septum having been strongly contracted hinders contracting of the ventricles that is indicated on the curve by the fact that there is no wave S available. 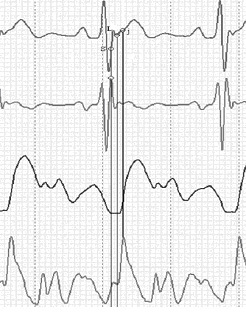 Both the phase of tension and the phase of fast ejection are indicated on the ECG by almost straight line. This practically straight line shows that there are no changes in signals between the differential inputs of the bio-potential amplifier, and hence no myocardium movements in this phase are available. Then, in phase of the early diastole, the interventricular septum is recovered and the cyclic process of the normal cardiac cycles occurs again and again. But sometimes, under certain conditions, it might be the case when the interventricular septum is not capable of relaxing and taking its initial position that might lead to the sudden cardiac death. One more consideration: a large stroke volume of blood may cause a cardiovascular accident. As shown in practice, a certain symptom picture is always available as a prognosticator of an abnormal QRS. Among other symptoms, there might be a periodic loss of consciousness. In such cases we could observe a partial loss of consciousness accompanied by heavy paraequilibrium. Considering sportsmen, it should be noted that “overtrained” people among them could belong to a risky group suffering from myotonia. A way could be offered to solve this problem by supplying a high-voltage impulse to the heart area so that the interventricular septum is relaxed. Beginning with the use of this method in 2004, the total number of patients examined by us with our latest heart analyzer exceeds 3000 persons. The data obtained by us upon their examinations make it possible to re-consider the existing theory of the operation of the heart and the cardiovascular system so that it permits of filling some existing gaps in the cardiology. An innovative method and an absolute new instrument of non-invasive determination of volumetric hemodynamic parameters have been developed, the principle of which is measuring durations of every cardiac cycle phase on the ECG and Rheo curves followed by their processing with the relevant mathematical equations describing “the third conditions” of liquid flow and calculating specific hemodynamic values of a patient. This instrument has been certified both in Russia and the EU. 1. G.M.Poyedintsev. On Flow Conditions in Blood Circulation. Collection of Scientific Papers: Development of Innovative Non-Invasive Methods of Examination in Cardiology. – Voronezh, 1983, p.17-35. 3. 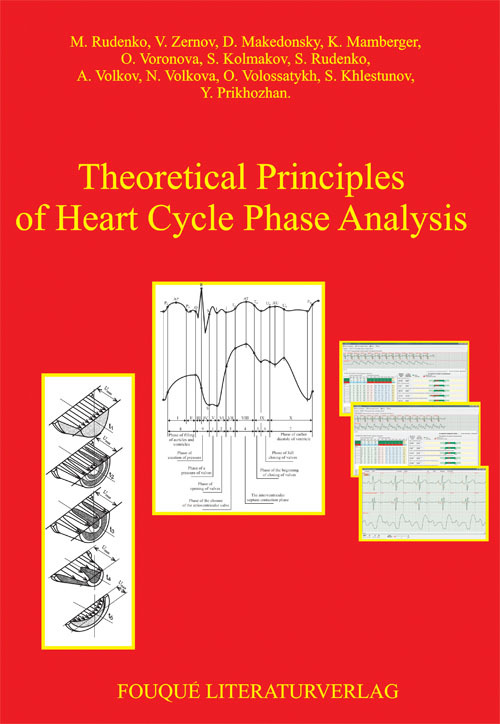 Theoretical Principles of Heart Cycle Phase Analysis.- Moscow , Helsinki: Publisher: ICM, 2007. – 336 pages.